Past few weeks have been one heck of a ride in gamerland hasn't it? You know what im talking about, Gamer Gate. While I can't say that I've been active in the movement in any significant way (it boils down to some twitter comment's mostly), it's still been a good read. And as with the whole Anita Sarkeesian shitstorm, I've discovered new worthwile things to spend my internet time on. But all good things must come to an end, and as I look at the direction everythings going, I feel I should say what's on my mind. As of now, it seems that big media sites are finally listening to what gamers want. And it has gone as far as The Escapist making a new ethics policy. But does any of this mean anything? Right now they're sucking up to us because there is a real threat of them losing their jobs, what happens when that threat goes away? Do you expect them to stop calling you misogynists? Are you sure they said those things solely for money and that none of them actually believe this? The reality is that if these actions are enough to end this movement, it has been for nothing. but the heart of the matter is, these are terrible sites with terrible writers and a simple ethics policy isn't going to fix a thing. This movement should end with the carsh and burn of these big websites. Why? Because trying to reform these sites is a hopeless cause and better alternatives have recieved more attention as a result of all this. 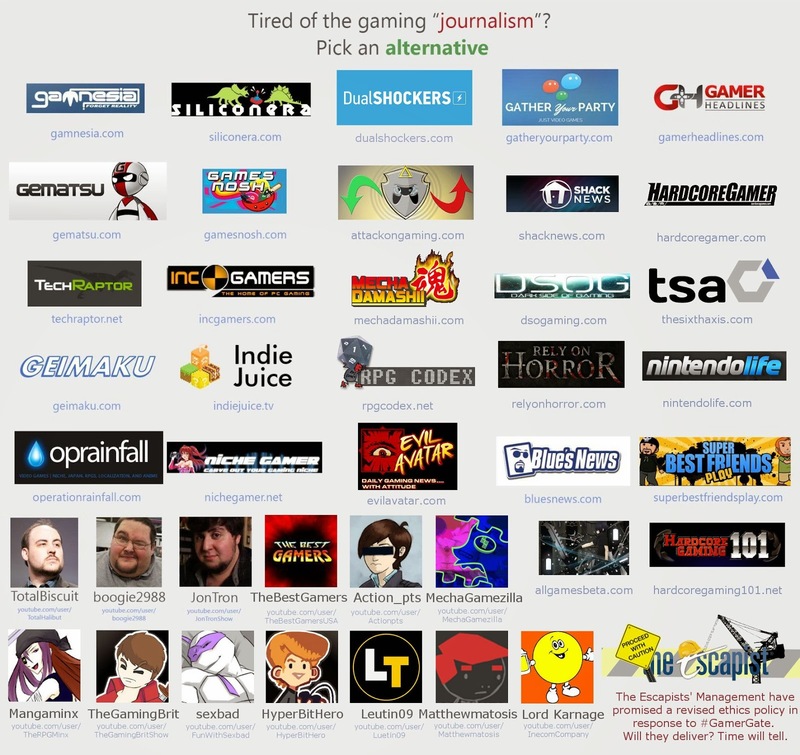 Give the sites listed a go, GameNosh and NicheGamer are at least by people who genuinely value gaming.